Open for Inspection is a socially engaged and participatory art exhibition project. Above: LiveHouse was physically based on a modified portable shipping container that opened up to provide an open-air undercover space for creative activities. The LiveHouse was temporarily installed on the corner of Drummond and Palmerston Streets, Carlton. 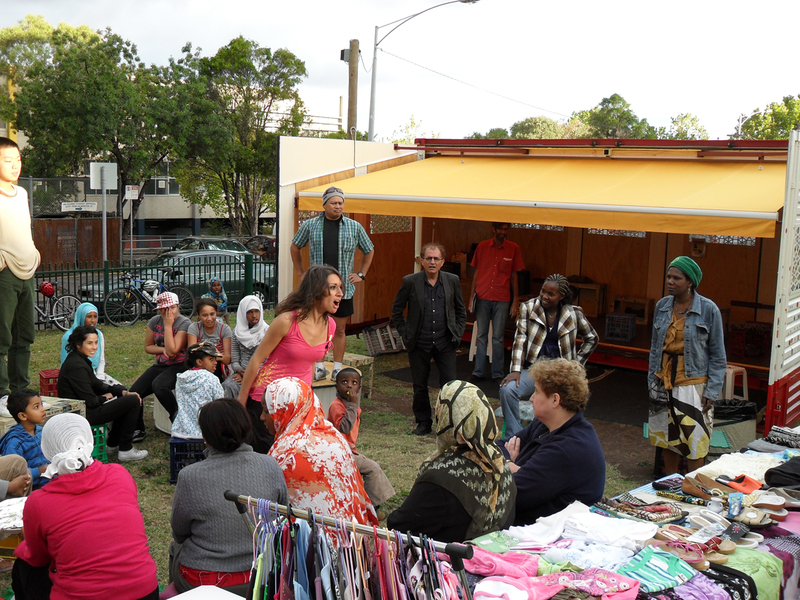 LiveHouse, a mobile performance platform project in collaboration with residents of the Carlton Housing Estate, Melbourne exploring mobility, migration and housing. Angry Woman from Mim Whiting on Vimeo. This is a segment from the 40 minutes of live projections that accompanied Underworld Songs, a cantata composed by Martin Friedel and performed by Astra Music choir and solo instrumentalists at the Abbotsford Convent, September 3013. The subject of Underworld Songs are ‘ordinary lives that have gone wrong’ through crime or misdemeanor or misfortune. The underworld of Underworld Songs is a metaphysical place for ordinary lives trapped in the bleak and melancholy world that unfolds from the pages of tabloids and police records. The backdrop is the city and the entrapment of daily routine that contrasts with the wanton violence of the Angry Woman’s crimes. The music in this segment is from Martin Friedel’s back catalogue as Underworld Songs as recorded at the performances has not yet finished mix. Voices, A tri-screen linear motion-graphic piece. 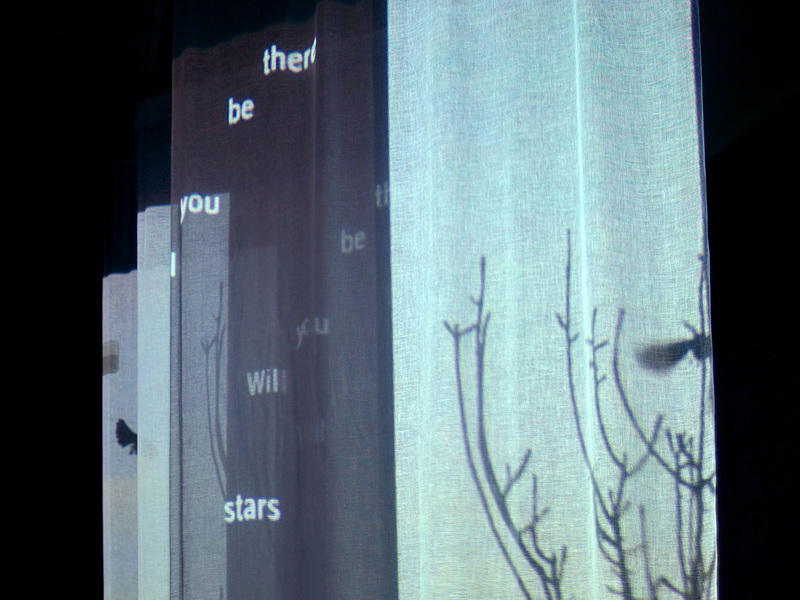 The participant’s photographic images and texts were composed and projected onto free-falling scrim in a darkened environment along with an original soundtrack. This video installation work was produced as part of an Australia Council for the Arts funded project Pieces, Suicide the Aftermath. The project involved arts practitioners working closely with families affected by suicide and aimed to ‘make visible’ those families experiences and understandings thereby promoting a wider social understanding of the extended impact of suicide within our communities. The project attempted to capture and reflect aspects of the complex journey of a grieving parent, both as a valuable reflexive experience for the project participant and as a strongly affecting communication of the implications and impact of suicide to a broader audience. A 2m high portable banner produced to support Tetoamatoa when they perform traditional dance, music and song. Tetoamatoa is a disabled people’s organisation from Kiribati islands in the Pacific. They have experienced a lack of services and support from their community and government due to low infrastructure and understanding of disabled people’s needs and capacities. During a series of workshops in Melbourne, funded by AusAid, Neal worked with the members of Tetoamatoa to visualise their understandings of their needs and the special strengths they offer one another and the broader community. In collaboration with Neal participants produced a range of cards featuring key statements and photography.